What's new in the Lending Library? 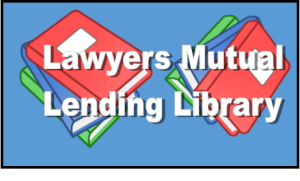 Have you checked out the Lawyers Mutual lending library yet? It's a free resource for all Lawyers Mutual insureds. The lending library has books on various topics to help enhance your practice. Whether you're looking for marketing tips or ways to manage your files--there's a book for that! One title that you may find helpful is: E-Lawyer: A Guide to Legal Practice Leadership in the Internet Age by Adam Newhouse. E-Lawyer: A Guide to Legal Practice Leadership in the Internet Age by Adam Newhouse is a must-read for lawyers who want to understand more about the changing nature of the legal profession considering the technology age. “Helping clients communicate with other law firms in the days leading to the Great Recession, I became acutely aware of lawyers’ pervasive lack of responsiveness to clients. Delays in returning phone calls or responding to emails seemed to go with the territory of legal practice. The speed of offering legal solutions was almost never a priority. Our proverbial tardiness is symptomatic of wider inefficiencies in our relationships with clients and management of law firms.” Newhouse goes on to offer solutions to assist lawyers in acquiring a “Digital Mentality” that will help them thrive. I highly recommend this book to all lawyers. Newhouse reminds us that doing what we have always done is no longer working. What matters is not the latest technology itself, but rather a new state of mind attuned to the digital environment in which we live and work. Check out this book today from our lending library.